The nights have drawn in; the temperature has dropped, and our wood-burner is at full throttle. 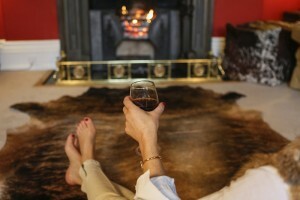 I love the seasons in Britain and embrace winter for its hot toddies; mince pies, mulled wine and the excuse to laze beside an open fire; silently nodding off as the logs crackle and spit. 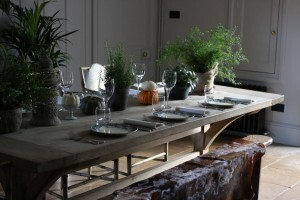 I’ve always liked the sound of the deliciously cosy, and now well-known, Danish concept – Hygge. ‘Pronounced HOO – GA. It basically means, finding simple ways to make life more enjoyable. “Hygge is an important part of Danish cultural identity, it means: “to give courage, comfort, and joy…Hygge in Denmark denotes a mood of coziness and comfortable conviviality with feelings of wellness and contentment.” Wikipedia. The Little Book of Hygge describes it as “cozy togetherness” and “coziness for the soul,’ engendering contented feelings which you get from enjoying the little things in life. So, this winter I’m going to strive to create just that. And this is how I plan to do it. What do you think? 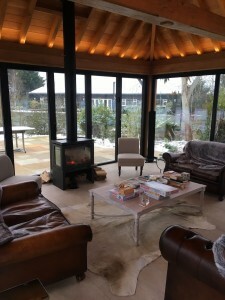 Ideally my hygge home would be a Norwegian Rustic cabin or an English thatched, country barn conversion, festooned in traditional natural green foliage – pine and holly berries, exuding character and warmth. The walls would be wrapped in fresh foliage emanating that wonderful Christmas tree/pine scent. Sadly, I don’t possess either style of home; but we’re very lucky to live in a lovely old Victorian village shop. Stoke up our open fire, (you just can’t beat a traditional fireplace: the sight, smell and warm sensation of spitting logs.) 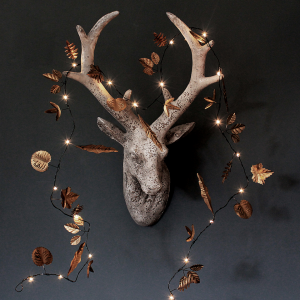 I’m going to drape a garland of twinkly fairy lights above the fireplace, like Primrose and Plum’s nature-inspired, rustic, gold leaf lights interwoven with intricate, metal leaves. 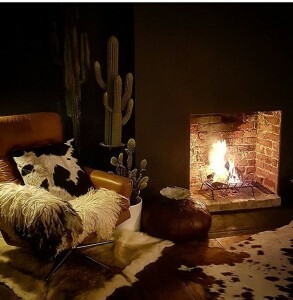 Then I shall curl up beside the fire on a soft, cosy, Zulucow cowhide rug; or sink into a ‘sea’ of Zulucow cushions, and gaze into the fiery light. 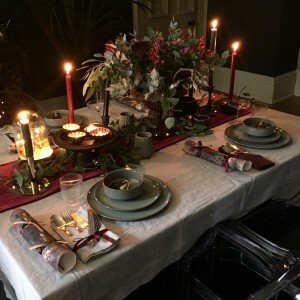 It goes without saying that I would invite a couple of close friends over for some convivial banter, a hot mulled wine, and we’d create some “cozy togetherness” around a gorgeous table like Irene’s! 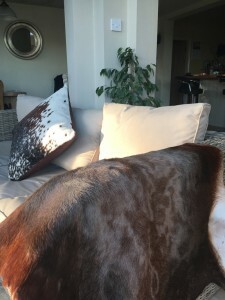 (See the photo below where Irene has made her dining room cosy by draping her Zulucow Blesbok rugs on her bench, for an added sense of warmth and cosiness. 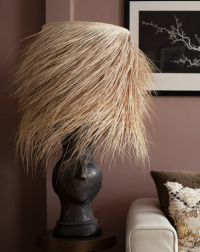 Zulucow Blesbok hide draped over the arms of sofas to evoke a hygge feeling of cosiness. 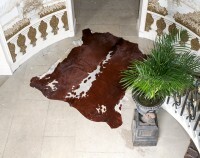 Jo’s Zulucow creamy, cowhide rug in her huge, ‘hygge’ barn. 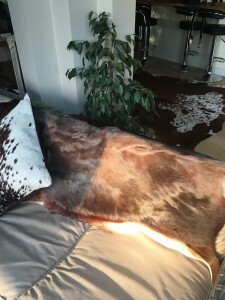 Tamsin’s pretty white and black speckled Zulucow cowhide rug in her cosy sitting room. 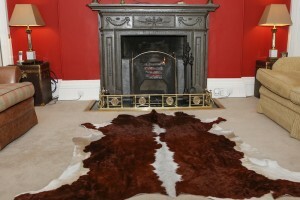 Alison’s dramatic ‘rich walnut’ Zulucow rug in her smart Georgian home.